Crystal Palace are no strangers to the dark arts of football with James MacArthur and Luka Milivoijevic currently ranking in the top five of the Premier League's most penalised players. In addition, a Palace player has led the league in fouls each of the last two seasons as the Eagles have adopted an attritional approach to the Premier League survival battle. However, toughness bordering on illegality is not a recent occurrence at Selhurst Park, so check out 90min's list of the eight hardest players in Crystal Palace's history. Milivojevic signed for Palace in January 2017 and has immediately earned a reputation as one of the Premier League's toughest tacklers. His exploits in the middle of the park have garnered 116 fouls and 16 yellow cards in the last two seasons as he, time and time again, defines the phrase "taking one for the team." In addition to his penchant for transgressions, Milivojevic has also become a reliable penalty taker, scoring 17 of 19 attempts in the Premier League. Patterson only played 22 times for Palace between 1992 and 1995, but will forever be fondly remembered around Selhurst Park for his relentless fearlessness embodied by one career-defining moment in 1994. In a heated FA Cup semi-final against Manchester United, tensions unleashed when Roy Keane stamped on current England boss Gareth Southgate. Patterson did not take kindly to Keane's antics and without hesitation engaged the Irishman in a confrontation that would earn the Palace player a red card. Despite never truly making his mark on the pitch, Patterson will always be fondly recalled as the man who fought United's controversial captain. Described by the Times as "six feet four inches of hard-core centre back, who had an unsentimental way with a headed clearance," Droy will be primarily remembered as a Chelsea player, but he still put in enough crunching tackles in red and blue to receive cult status in his two-year spell at Palace. Not content with simply flattening footballers, Droy even climbed into the boxing ring with once European heavyweight champion Joe Bugner, although the pair didn't let their sparring get out of hand. Dennis only played one season in south London, but no Crystal Palace list of hard men would be conclusive without the presence of the man labeled 'Psycho'. Sent off 12 times in his career, Dennis contributed some iconic moments for the Eagles including running the length of the pitch to swing at Paul Gascoigne and getting sent off for a horrific tackle in a pre-season friendly. Gilbert rose through the Palace development system and went on to play over 200 times for the club, culminating in 1984 Player of the Year honours. Gilbert's actions have become something of folklore around Selhurst Park as legendary stories are told of the defender tackling advertising boards, breaking an opponent's shinpad in half, and perhaps most epitomising, fighting Fulham's John Mitchell. Gilbert walked off the pitch after seeing red, Mitchell was carried off on a stretcher. After committing a particularly reckless tackle in 2000 the Australian midfielder was dubbed "the most hated man in football", thereby aptly summing up Muscat's nasty reputation. ​​During his two year spell at Palace, Muscat incited a 21 man brawl after getting sent off for body checking Norwich's Darren Eadie, while the wild tackler also seriously injured Christophe Duggary in a friendly between Australia and France in 2001. After being released by Palace's academy Gray returned to his boyhood club in 1984 and went on to play 98 times while earning himself cult status for his crunching tackles and famous FA Cup semi-final equaliser against Liverpool. The Palace faithful gleefully noticed that midfielders tended to get rid of the ball a fraction quicker when Gray was about, in order to avoid one of his stinging tackles, and he is well remembered for duelling with Dennis Wise, even slapping the diminutive former Chelsea captain. Now in the twilight of his career at arch-rivals Brighton, the big uncompromising forward was a battering ram for the Eagles as he smashed 44 goals in 112 matches before departing for Bournemouth in 2015. 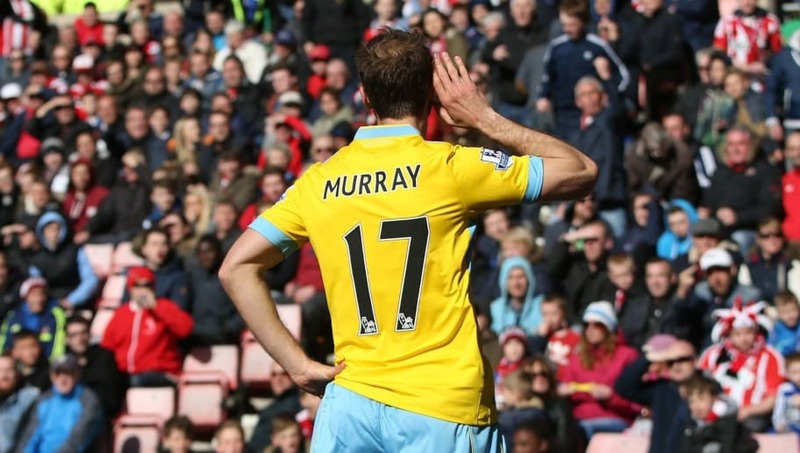 Never one to back down from a physical altercation, Murray leads the Premier League in fouls over the last two years with 127 infringements.